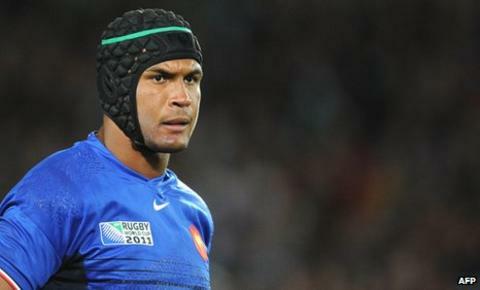 France captain Thierry Dusautoir has been named the International Rugby Board's player of the year. The award will come as some consolation to the 29-year-old flanker following his team's 8-7 defeat by New Zealand in the World Cup final on Sunday. The world champions are team of the year, while All Blacks boss Graham Henry is coach of the year. England Under-20 fly-half George Ford, who plays for Leicester, took the young player of the year award. Dusautoir succeeds All Blacks skipper Richie McCaw, who has won the accolade for the past two years, and is the first Frenchman to receive the award since Fabien Galthie in 2002. The other five nominees were the New Zealand trio of scrum-half Piri Weepu, flanker Jerome Kaino and centre Ma'a Nonu, and the Australian pair of flanker David Pocock and scrum-half Will Genia. Ford is the first Englishman to claim the young player award, although Wasps and England scrum-half Joe Simpson and Sale forward Carl Fearns were nominated in 2008 and 2009 respectively. Wales back Gavin Henson is the only other Briton to have won the prize, in 2001. At just 18, Ford was the youngest player at the Junior World Championship in Italy in June. "It's a massive honour especially when you consider the calibre of player who have won it in the past as well as the others [New Zealanders Sam Cane and Luke Whitelock] nominated," said Ford. "I couldn't believe it when I found out to be honest, but I've got to be quick to point out that rugby is not an individual sport. All of the lads were awesome throughout the whole campaign and I'd like to think that I'm picking the award up on behalf of them." South Africa's Cecil Afrika is the IRB sevens player of the year while Australia number eight Radike Samo won try of the year for his 60m rampage in the Tri-Nations against New Zealand.